Shopping this time of year, I often encounter a dress for sale that would be perfect to wear to a holiday party. And I often buy what I find with the hope that I will have the occasion to wear it. Want to know how many sparkly dresses are hanging in my closet that I have never worn? They are to-die-for dresses and I am dying to wear them if only I get invited to a holiday party. I did get invited to my former employer's Christmas luncheon/party last year where I did dress pretty, but now that I left the building over a year and a half ago, I doubt I will get invited back this year. My 2017 holiday luncheon outfit. I cannot picture a party that would not be improved by Stana. Were I in CT and throwing a party, I would invite you! I know exactly what you mean. I too have a number of party perfect dresses in my closet that I simply could not resist. I often wonder what world those cocktail having people live in. Then there is always the thought of walking the red carpet, or that beautiful dress for my dream wedding. Have you looked on meetup.com for transgender groups near you that may hold get togethers (holiday or otherwise)? If one doesn't exist, have you considered starting one? I know the groups around here attract a number of ladies to gatherings year-round. YUP! 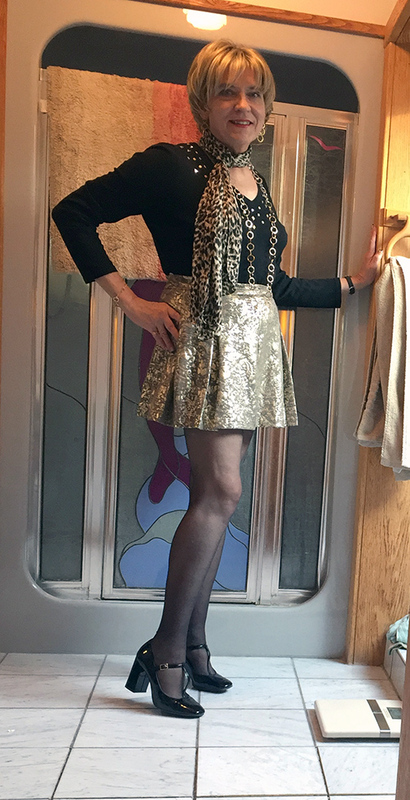 I know the 'sparkly dress fetish' well. Soon many of those same dresses will be 'donated' unfortunately after not having been worn. Sad. "All sparkly-ed up and nowhere to go." Those donations are later found by the likes of 'me' and well, the planning starts all over again. Perhaps just try crashing a cocktail hour at a convention Hall or just hang out in the bar of a big fancy hotel or casino?